Clarence Junior Black, age 65, of Fayetteville, TN passed away on Friday, February 1, 2019. He was born on May 9, 1953 in Pulaski, TN to the late Lee Andrew & Ceola Parks Black. He worked as a brick mason. In addition to his parents, he is preceded in death by his sister: Alene Black; and brothers: Tommy Black and Larry Black. 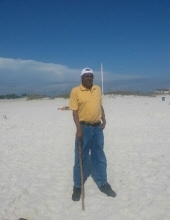 Mr. Black is survived by his children: Damon (Shantal) Black and Shykeyia (Lavell) Finch; step-children: Randy (Rosalyn) Reese and Takeysha Reese; sisters: Dorothy Black Dukes and Maola Black; brothers: Andrew Black and Jeff Black; grandchildren: Keyera Black, Breanna Black, Ajahnai Black, Deven Finch, and L.J. Finch; special friend: Othal Ford; and a host of aunts, uncles, nieces, family, and friends. A Celebration of Life will be conducted on Friday, February 8, 2019 at 2:00 p.m. in the chapel of Gallant-Riverview Funeral Home. The family thanks you in advance for your support and service to their family during the time of loss of their loved one. "Email Address" would like to share the life celebration of Clarence Junior Black. Click on the "link" to go to share a favorite memory or leave a condolence message for the family.